Wanted a small berry orchard and this was key. I bought a bunch of small types of berries and it worked great! Wild Strawberry Plant vines are easily accessible in wooded areas, meadows, yards, and riversides. Leaves are developed in groups of threes Each leaf is around an inch and a half long. The leaves have notched edges and grow the stems are covered with tiny hairs. Like nearly all runners, it increases its ground cover rapidly and springs up new plants. Peak bloom season is from May until June. Petals are around three-quarters of an inch wide. The flower is made up of five of the tiny, white petals. The petals are joined together in the middle of the flower by a yellow cone. The strawberry fruit will emerge from the yellow cone after the plant is pollinated. 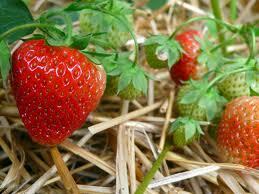 Just like the commercial strawberries that many are so familiar, the seeds are found in the skin of the fruit. Several small mammal species and even turtles make use of the strawberry for food. Humans have taken advantage of the edible strawberry. Larger animals such as deer and insects have been known to eat the leaves of the plant. Insects have also used the flowers for its nectar. Shelter and refuge are often taken in the plants leaves. Even though it can be very useful to several animals, some people consider it a weed because it can be very invasive. Wild Strawberry stretches its runner just about anywhere. The very nature of the runner make division and transplanting very simple. Wild strawberry plant vines are cool season plants and do best in soils that are moist and well drained. Dry soils can be tolerated, however. Wild strawberry plant vines may be useful for covering bare spots in the area or for creating a natural edge. Wild strawberry vines are found readily available in wooded areas, fields, yards, and streamside. It creeps just about anywhere. Leaves grow in sets of threes. Each leaf being about an inch and a half long. The leaves have serrated edges and grow on hairy stems. Like most runners, it spreads along the ground quickly and sprouts up new plants. Flowers begin to bloom in May and last until June. Each flower has five small white petals about three-quarters of an inch wide. The petals meet in the center and are attached to a yellow cone. The cone eventually becomes redder and bigger to become the strawberry fruit. Much like its larger counterpart, the seeds are sunken in on the outside of the fruit. Much native wildlife such as birds, chipmunks, turtles, and mice eat the fruit. Humans have also eaten the small fruit. The leaves consume by other wildlife like deer and insects. Many other insects drink from the flower nectar. The runner itself offers shelter for many animals as well. As beneficial as it may be too many animals, it can be invasive in nature. Wild Strawberry can reach two feet in length. The runners make it easy to separate and transplant new plants to other areas of the yard or garden. They grow in the cooler season in moist, well-draining soils but can also handle dry soils as well. Often used for ground cover and edging, the clumping nature of the wild strawberry vines make this ideal.